The latest in the great Palestrina series from The Sixteen, the Sistine Chapel Choir, and selections from Monteverdi’s sacred works. I. Palestrina Volume 7: (The Sixteen/Harry Christophers). Coro CD COR16155. From Gramophone: After a hiatus of a couple of years The Sixteen’s Palestrina project resumes, this time featuring music for female saints and biblical figures – Mary of course, but also the Magdalen, Barbara and Susanna. The disc opens with a Resurrection motet, told from the perspective of the three women who discover Christ’s empty tomb. This selection is especially astute programatically, with its echos of the Song of Songs cycle that has been a regular feature of the project from the outset. Most of these motets are on a comparatively large scale, matched by The Sixteen’s comparatively monumental delivery, which doesn’t exclude a certain sprightliness at the end of the Susanna motet, for example, or at the ‘Et resurrexit’ of the Mass. For as has also been the case throughout, the centrepiece is a Mass, based this time on one of the more famous and musically significant Marian antiphons, Ave regina caelorum. Its gentle cast gives The Sixteen a chance to inhabit a more restrained idiom. The Kyrie promises as much, but whenever the text licenses it (in the longer movements particularly) that triumphant note creeps back in. This is Palestrina as Counter-Reformation poster-boy, a view to which we’ve got used from previous instalments (and from many other ensembles, to be fair). It’s often admirably executed; but there are other sides to the composer, and this Mass in particular seemed to invite a more expressive, even intimate approach. Once or twice there are slight signs of strain, too (towards the end of the Credo at ‘qui locutus est per Prophetas, et unam sanctam …’); perhaps a more rhapsodic demeanour wouldn’t have gone amiss. The Sixteen have achieved much in this series; I hope they’ll have kept a surprise or two up their sleeves before it’s done. II. 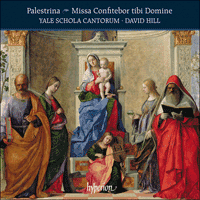 Palestrina: Missa Confitebor tibi Domine (Yale Schola Cantorum/David Hill). Hyperion CD CDA 68210. Taking his surname from the town of Palestrina where he was probably born in 1525, Giovanni Pierluigi trained as a choirboy at St Mary Major in Rome. After a period as organist in Palestrina he was appointed magister cantorum at St Peter’s in 1551. Four years later he spent a short time as a member of the papal choir before Pope Paul IV enforced a rule excluding married men and dismissed Palestrina and two other singers, though with a lifetime pension. He subsequently took charge of the music at St John Lateran and, after a disagreement with the canons there, moved to St Mary Major in 1561. Between 1567 and 1571 he divided his time between the newly opened Roman Seminary and service to Cardinal Ippolito II d’Este. Then, in 1571, he returned to St Peter’s as maestro, remaining there until his death in 1594. In 1572, shortly after that return, Palestrina published his Motettorum liber secundus, 5, 6, 8vv, which included four pieces for eight voices, one of which was Confitebor tibi Domine. The range of musical styles in the print reflected both his varied employments and the changes which resulted from discussions about the appropriateness of contemporary church music at the time of the Council of Trent (which had concluded in 1563). These changes gave greater prominence to the words and their intelligibility to the listener. While ostensibly composed for two equal groups of four singers, Confitebor tibi is not written for two physically separated choirs. The two groups are not used consistently but voices are gathered into continuously varied combinations. Full tuttis are rare, largely confined to the end of each of the motet’s two halves. The texture is mainly chordal, broken up by scales and other figures. These techniques expand on those used in Palestrina’s six-voice Missa Papae Marcelli, which became the classic model for combining musical interest with clarity of word-setting. The end of the second part of Confitebor tibi is particularly appealing, with the word ‘Exsulta’ (‘Rejoice’) highlighted by long roulades in all parts, followed by some beautiful antiphonal dialogue on ‘Sanctus Israel’ (‘the Holy One of Israel’) before a final sonorous tutti rounds off the piece. The text, chapter 12 of the Book of Isaiah, is essentially a psalm of praise in two sections interposed into the prophetic text. It has the usual structure of a psalm: a series of short verses divided in the middle, with each half-verse complementing the meaning of the other half. Some years later Palestrina based a Mass setting on this motet, a common practice at the time. The Missa Confitebor tibi Domine was copied into one of the papal choir’s manuscript choirbooks in about 1577 (when Palestrina was its official composer) and was subsequently published in 1585. The Mass is composed for two separate choirs—called ‘cori spezzati’ in Italian—with a clear division into two equal groups and with both bass parts avoiding the fifth of the harmony, necessary if the choirs are to be physically separated. In the Sistine Chapel, however, such division was not possible since the singers occupied a single ‘cantoria’ on the right-hand wall, but plans for publication would have led Palestrina to write it in the increasingly popular polychoral style for choirs placed on separate platforms or galleries. Like other so-called parody or imitation Masses, the six movements re-mix musical material from the motet, adapting it to the new words and adding new material where necessary. The opening of the motet is used for the beginning of all the major sections of the Mass, and for most of its sub-sections, while its end is used for the final bars of the Gloria, Credo and Agnus Dei. The scales used to highlight the word ‘Exsulta’ in the motet are put to good use in the final Kyrie and at a number of points in the Credo and Sanctus. Both of these movements have extended sections for four voices. Palestrina’s Magnificat primi toni for eight voices was also copied into a large choirbook for the papal choir, probably in the late 1580s. Not intended for publication, it is not written for spatially separated choirs: though there is now more consistency in the division, some sections combine voices from across the two choirs. Tutti writing is again scarce, confined to the words ‘omnes generationes’ (‘all generations’) and to the end of the piece; most verses see the two groups alternating, using a largely chordal texture enlivened by scales and other figuration. This frequent exchange is marked by regular cadences which give a tonal G minor feeling to the music which is notated, like Confitebor tibi and the Mass, in the first (Dorian) mode transposed up a fourth to G. The text of the Magnificat, taken from Luke’s Gospel, speaks of Mary’s happiness in accepting her role as mother of the Saviour, while also stressing her Son’s mission to the poor. Palestrina reduces his forces to a quartet of two sopranos, alto and tenor for the key phrase ‘Quia fecit mihi magna qui potens est: et sanctum nomen eius’ (‘For he that is mighty has done wondrous things for me: and holy is his name’), making particularly effective use of two intertwining sopranos. He uses just the six lower voices for the next phrase, ‘Et misericordia eius a progenie in progenies timentibus eum’ (‘And his mercy is upon them that fear him throughout all generations’), before returning to eight voices for the remainder of the setting. Palestrina’s motets were published in separate partbooks, one for each voice part. This did not mean that they were only performed like that, with one or more unaccompanied singers on each part: in the liturgy they could be accompanied, or substituted, by organ and by instruments like the cornett and sackbutt. Motets also had a use outside of the liturgy, sung for entertainment which might be devotional or not. In that context the words could be dispensed with entirely, with one or more parts played on solo instruments and accompanied by organ, harpsichord, lute or theorbo. The Venetian virtuoso cornett player and composer Giovanni Bassano came from a family of wind players employed in both Venice and London. In 1591 he published a volume of arrangements of motets, madrigals and canzonas by various composers, with his own embellishments for a variety of instruments or sung as ornamented solos. Two of these, Palestrina’s Benedicta sit sancta Trinitas and Introduxit me rex, are performed here by cornett and organ. In both, the top line is played in a decorated fashion by the cornett while the other parts are played on the organ. Bassano’s ornaments are generally formulaic and invite further improvised ornamentation as here. Bruce Dickey has made his own arrangement for cornett and organ of another Palestrina motet, Loquebantur variis linguis, for this recording. Motets could also be played on the organ without singers or instrumentalists, in which case they became studies in counterpoint, each successive phrase exploiting a musical motif which, though originally conceived to match a phrase of text, could also function on its own. This was the basis for the Italian instrumental ricercar made up of a series of imitative workings of themes, called points of imitation. Eight such ricercari are attributed to Palestrina in a late-sixteenth-century Roman manuscript, one in each of the church modes. They appear with a large number of scored-up motets by him and a host of his contemporaries; the manuscript is thought to have been compiled by a Roman organist for his own use. Ricercari could be played during Mass, particularly during the Offertory, or in other liturgical contexts. Their attribution to Palestrina cannot be verified but he did play the organ and, if he had composed such pieces, they would certainly have been in this style. The two performed here are in the fifth and sixth modes, both Lydian, using the white-note scale starting and finishing on F; in practice the B natural was often replaced by a B flat to avoid the prominent tritone, so that they sound more like our modern major scale. The difference between the two ‘tuoni’ is that the ‘quinto’ exploits a higher range than the ‘sesto’. The former is played by cornett and organ here, the cornett taking the top voice with the other three being played on the organ; the Ricercar del sesto tuono is played on organ only. The music on this recording represents the repertory performed at St Peter’s, or in other Roman churches, in the late 1570s or 1580s, during the celebration of Mass and Vespers on a patronal feast day. On such occasions extra singers (if necessary) and instrumentalists were brought in to attract and impress crowds of people and to fill the large central spaces of the new early-baroque churches then being erected throughout the city. Much of this music displays the more richly sonorous and proto-baroque side of Palestrina’s style, often overlooked due to his received image as a relatively austere composer with a particular skill in counterpoint. As we can hear, that skill was certainly there, but so too was a marvellous ear for musical architecture and a strong commitment to matching the music to the text. III. Palestrina: Missa Papae Marcelli (Sistine Chapel Choir/Massimo Palombella). Deutsche Grammophon CD DG 479 6131. Deutsche Grammophon launched its latest exclusive collaboration with the Sistine Chapel Choir on Friday 7 October with a press conference and special concert at the Sistine Chapel in the Vatican. Members of the Vatican clergy were joined by dignitaries, diplomats and representatives of the international media to hear performances of a selection of works from the Choir’s new album. Palestrina, only the second recording to be made under studio conditions in the Sistine Chapel, follows the yellow label’s pioneering release of Cantate Domino in September 2015. It comprises the world premiere recording of the 1567 first edition of Palestrina’s Missa Papae Marcelli together with a selection of motets conveying the essential message of divine generosity and compassion. The album celebrates the “Extraordinary Jubilee of Mercy” (8 December 2015 to 20 November 2016), defined by Pope Francis as “a revolution of tenderness and love”. Massimo Palombella, director of the Sistine Chapel Choir, explored the vast resources of the Vatican’s library in search of music with the power to transcend personal fears and offer comfort in our troubled times. He discovered that the earliest publication of Palestrina’s Missa Papae Marcelli differed from the modern editions usually employed for performances and recordings. Monsignor Palombella transcribed the original version into modern notation and worked with his Choir to try and recreate the way in which the Mass might have been performed by the Sistine Chapel singers during Palestrina’s lifetime. In addition to the Missa Papae Marcelli, Massimo Palombella chose to record nine liturgical motets by the composer on the theme of mercy. These include Ad te levavi oculos meos, a tour de force of contrapuntal invention, and the world premiere recordings of Veritas mea et misericordia mea and Iubilate Deo. Palestrina also contains the first recording of Confitemini Domino to be sung by male voices only, as it would have been in the late 1500s.